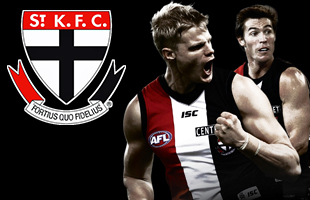 Tickets are now on sale for the ANZAC Day AFL match between the St Kilda Saints and the Brisbane Lions. The match promises to be an action packed showcase of the skill, athleticism and excitement of AFL. An exciting series of matches will be running in conjunction with the ANZAC Day AFL clash. The New Zealand Hawks will be taking on the South Pacific Nations. Buoyed by the early success of Porirua teenager Joe Baker-Thomas, St Kilda are pledging to continue their aggressive hunt for New Zealand talent. The St Kilda Saints visited the Central Pulse netball team as part of their AFL Community Camp in February. The teams took part in a cross code challenge, with elite athletes from both teams sharing tips and advice. Both teams have enjoyed strong starts to their respective seasons. 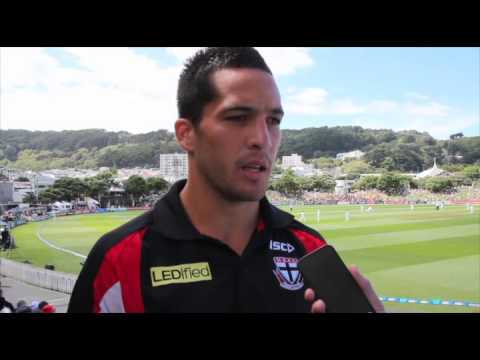 The St Kilda Saints have been training hard in the lead up to the 2014 AFL Season. Giovanni Mountain-Silbery may have grown up hoping for a career in rugby league, but the 16-year-old Auckland schoolboy now looks destined to make it in the AFL. St Kilda recruit Shane Savage is ready and willing to fly the flag for AFL in New Zealand. The Auckland-born 23-year-old is in Wellington this week for a Saints community camp ahead of the Anzac Day match against the Brisbane Lions at Westpac Stadium. The Australian Football League is pleased to announce Sommet Sports and SKY Sport have renewed their international rights for the next three years. The New Zealand Hawks are set to take on the best young players from Australia. New Zealand Hawks vs AIS AFL Academy will be played at Westpac Stadium, Wellington, on Saturday the 25th of January. The match will begin at 12.00, with free entry for all.